This article is about The Heartless. You may be looking for one of Donald's Staves. When its HP gets low, it unleashes its Press attack. Use Bump and Meteor Strike for a counterattack combo! Meteor Strike can be done in succession, so make sure to grab surrounding enemies as well! 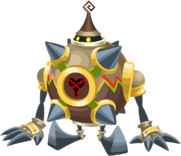 Sharp spikes cover these large Heartless, a fact they exploit in a dangerous spin attack. Though they are impervious while spinning, you can slow their onslaught with a block, bringing them to an eventual halt. Alternatively, Aero magic will stop them with a single blast. When its HP gets low, it can raise its defenses and heal itself. Use a defense-decreasing special attack before attacking and it'll be seeing stars! The Morning Star is an Emblem Heartless that is found in Kingdom Hearts II and Kingdom Hearts 358/2 Days. The Morning Star has a black, spherical head with two beady, yellow eyes on it. It wears a conical, green helmet with an angular antenna attached to its tip. The majority of its body is encased in a spherical suit of armor with eight conical, black spikes spaced evenly over its surface. This armor is primarily colored in shades of green, with some yellow decorations on it. Its thin arms jut out of circular openings in the armor on either of its sides. Its spindly legs share a large, circular opening at the bottom of the armor, and the tips of its feet point upward. 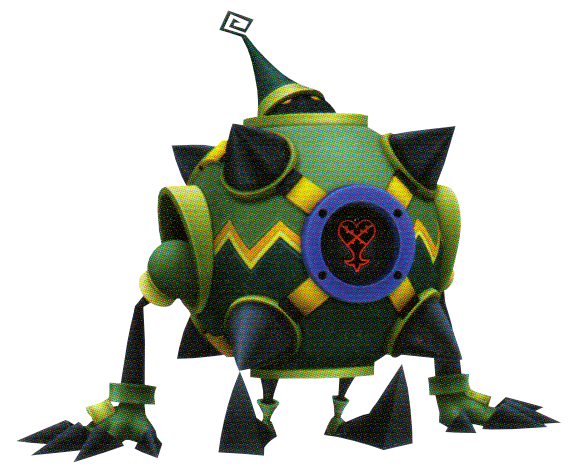 It can retract its arms and replace them with two large spheres covered in spikes, which it uses to beat enemies. The Morning Star has two Heartless emblems, on its front and another on its back, both of which are placed in the middle of a blue ring with a black background. 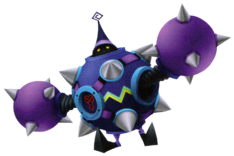 In Kingdom Hearts II Final Mix, the Morning Star's armor becomes blue with cyan, violet, and some yellow highlights on it. Its spikes are now silver, as opposed to the normal black. The Morning Star's name refers to the melee weapon of the same name, which the Heartless resembles. Its second set of arms in particular are very similar to a morning star mace. Body Press (ボディプレス, Bodi Puresu? ): Leap high into the air and crash down. Can be countered with the Reaction Command "Bump," followed by "Meteor Strike," which can be done numerous times.